Available in White and Black as well as for the Nano, this tough-as-bolts case is made of a hard case that features a flip-out stand and a headphone management system. I’m particularly impressed with this as it’s the first case I’ve come across that has a dedicated system for making sure your headphones don’t tangle in your pocket. Sweet! Designed to fit both the 30GB and 60GB iPod with Video models, naturally it is a bit bulkier than you’d expect for all those 30GB owners out there. 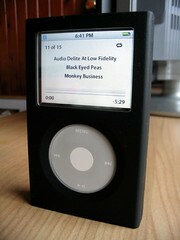 However it’s not too bad and who wants to always be looking at the same iPod design all the time anyway? Whilst the case fits in my jacket pocket with no problems of weight or bulk, it struggles to fit in my jeans – it does fit though. That’s not the point of this case though. The whole concept that Marware are selling with this case is that it’s a rugged and tough case for protecting your iPod against drops, knocks and scratches and it has clever features to boot, like the flip-out stand and slide-out headphone wrap around system. The flip out stand on the back allows you to position your iPod on your desk and enjoy watching your movies or playing slideshows of your photos. What a genius idea! There’s a neatly hidden side compartment at the side as well. Just slide this part out and you’ve got something to wrap your iPod headphones around so next time you get your iPod out, just unwind rather than untangle! The fact it has this feature is a key seller for me. I would just buy it for this one tiny feature. It’s surprising how Marware have managed to solve one of the most annoying problems for portable audio devices. 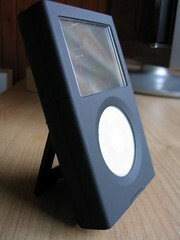 With this one case they’ve just relieved a major thorn in the side for iPod owners. Despite being one of the toughest iPod cases out there, Marware haven’t compromised on accessibility and functionality on this case. They’ve left plenty of room for the headphone jack to fit audio out cables, video cables or car cassette adapters. At the bottom of the case you’ll find a nice flip open door that grants access to the data port. Another factor about iPod cases is the ability to remove your iPod easily whenever you want. 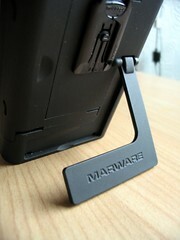 Marware have again come out top on this with a slide out door where the headphone and hold switch tab is. Just slide this out and out comes your iPod. Since this case is designed for both the 30GB and 60GB models, Marware have solved the problem of the 30GB model being thinner by adding extra padding that you just slot in. You can easily remove this if you ever change to a 60GB model. Rugged tough looks combined with form, functionality and clever-thinking has turned out to be a winning combination for Marware. One of the better case designs I’ve seen recently and without hesitation, give this a TechCast Recommended award.